This is the old Edgebrook Bridge in Maplewood. Demolished in the 1970s, it once connected Bartold Ave. in Maplewood to Summit Ave. in Webster Groves, spanning Deer Creek and the Missouri Pacific railroad right-of-way. It was built in 1896 for the streetcars of the Howard Electric Line. Streetcars rumbled over the bridge until 1949 when the line converted to buses. When Edgebrook Bridge was built it was the longest steel street railway bridge in the world! 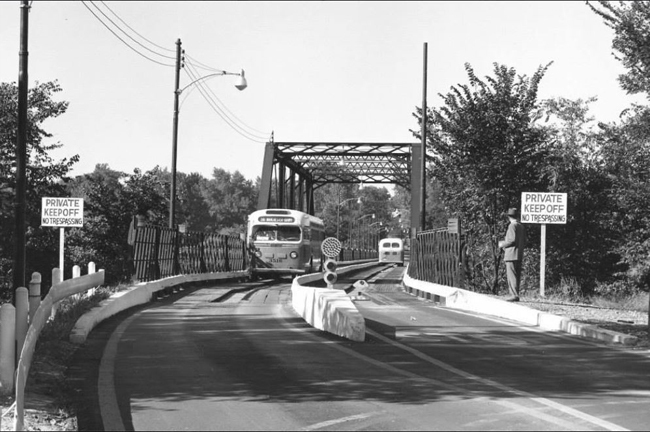 Edgebrook bridge Maplewood/Webster Groves 1950’s when they stopped running streetcars on the bridge and began to run buses. Last day for streetcars on the bridge was April 2, 1949. What a loss! You could ride all the way from the old courthouse downtown to downtown Kirkwood via Maplewood and Webster Groves. MetroLink crosses the Union Pacific tracks (under Edgebrook bridge) just east of here.